History and Types of Religious Arts and Crafts in the Middle Ages. Cathedral of Saint Lazare, Autun. In visual art, the term "Medieval era" (also known as the Middle Ages) describes the period from the Fall of Rome (c.450) in the West, to the Fall of Constantinople (1453) in the East. However, the first centuries (450-1000) - commonly known as the Dark Ages, were marred by barbarian violence and upheaval. During this initial period, the only significant cultural activity that existed took place within isolated monasteries of the young Christian Church. One of the first types of Early Christian art to emerge were the beautiful illuminated manuscripts and the ecclesiastical Celtic-style metalwork produced in Ireland and northern Britain - see especially Irish Monastic Art (500-1200). Although predated by both the Ethiopian Garima Gospels (390-660, Abba Garima Monastery) and the Syrian Rabbula Gospels (c.586, Laurentian Library, Florence), the Biblical art created in Ireland at this time was part of a monastic tradition of crafts that continued unbroken from about 500 to 1200. It included masterpieces like the Book of Durrow (650-80), the Book of Kells (800), the Ardagh Chalice (8th/9th Century), and a series of Celtic-style High Cross Sculptures (750-1150). Medieval crafts didn't really get started on the Continent of Europe until the advent of King Charlemagne and his Ottonian successors. During this period of Carolingian art (750-900) and Ottonian art (900-1050) - thanks to the support of secular leaders - Christian art underwent a revival across Europe. Arts and crafts which benefited from this patronage included architecture and design, goldsmithery and silversmithery, as well as sculpture and ivory carving. In addition, the making of illuminated manuscripts (which itself involved the crafts of book illustration and miniature painting, plus goldsmithery) was greatly expanded to keep pace with the demand for biblical texts. From 450 to 750 the Church in Rome had kept alive the practice of medieval Christian art in its far-flung monasteries in Ireland and the Middle East. But it wasn't until Charlemagne was crowned Holy Roman Emperor in 800 and proceeded to establish a network of monasteries and cultural centres of excellence, that a revival of arts and crafts took place on the Continent of Europe. In the Middle East, however, medieval Christian culture was much stronger, thanks to the traditions of Byzantine art (400-1200). 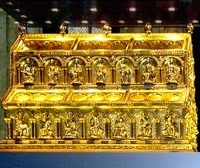 Byzantine Christian art was especially strong in metalwork and bronzework, reaching a peak between 800 and 1200. In Kiev (.950-1237), for instance, both cloisonné and niello were taken to new heights by Eastern Orthodox gold and silversmiths. The next major phase of Medieval arts and crafts was triggered by the Church's program of cathedral construction, which unfolded during the 11th century in France before spreading to the rest of Europe. Its initial program of Romanesque architecture (c.1000-1150) featured structures like the large Abbey Church of Cluny (927), Durham Cathedral (1093), Speyer Cathedral (1106), and St Lazare Cathedral, Autun (1146). It was followed by a second program in the new style of Gothic architecture (from about 1150 onwards) which featured a number of stunning Gothic cathedrals including Notre-Dame Cathedral (1163-1345) and Chartres Cathedral (1194-1250). For an explanation, see the Gothic Architectural Style (c.1120-1500). 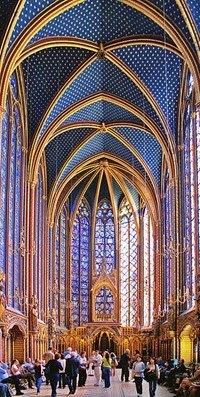 Every cathedral needed lots of stained glass art and stone statues for its walls; wood carving for its choir-stalls and pulpits; and precious metalwork for its altars, reliquaries, liturgical vessels and ceremonial crosses, much of which involved decorative enamelling techniques such as cloisonné enamelling and champlevé enamelling. As a result, this European-wide building program created a massive demand for medieval artists and craftsmen of all types, in particular for experts in medieval sculpture and medieval manuscript illumination. NOTE: For information about advances in illuminations, murals and painted altarpieces, see: Medieval Painting (c.1180-1420). For details of painting developments in Italy during the trecento (14th century), please our article on Pre-Renaissance Painting (c.1300-1400) as well as Proto-Renaissance Art (1300-1400). For the names of painters involved, see Proto-Renaissance Artists. Around the beginning of the quattrocento (15th century) the medieval era was superceded, south of the Alps, by the Italian Renaissance (1400-1530). But in Germany and other northern areas, the medieval style lingered for several decades. See, for instance, the medieval German Gothic sculpture of Tilman Riemenschneider (1460-1531) and Veit Stoss (1450-1533). The greatest patron of the arts throughout the Middle Ages was undoubtedly the Church. It was the age of faith. The Church commissioned great cathedrals and monasteries, luxurious robes, shrines and reliquaries for sacred relics and vessels for the Mass. No other patron, not even the king, could equal its resources. The rebuilding of a cathedral would receive more in donations from the faithful than any tax could raise and the bishops themselves were often immensely wealthy in their own right. NOTE: The foundation of new religious orders in the early 1200s, like the Augustinians, Dominicans and Franciscans, each with its own network of monasteries, provided the Church with an expanding infrastructure of sites and personnel to help manage the commissioning of all types of art and architecture. The great Bishop John Grandisson elected to the see of Exeter in 1327, revealed his luxurious tastes in his will. To his cathedral he left silver-gilt statues of St. Peter and St. Paul, a silver-gilt cross resting on four lions standing on a great enamel base, illuminated books, embroidered vestments, altar cloths and other objects. His purple velvet cape - a processional robe - embroidered with figures, was left to the Pope, Urban V. Rich laymen also employed craftsmen for religious work - they commissioned chantry chapels, where masses were sung for their souls, and sculpture for their tombs. Next to the Church, the king was the most important patron of the arts. He had the right to command every kind of craftsman to come and work for him. In 1343 John de Walworth, a London glazier, was ordered to glaze the windows of the King's Chapel and new chambers in the Palace of Westminster. The king's influence could be very great in establishing or fostering a new craft. To bring tapestry weaving to Bohemia, Charles IV of Germany brought a colony of Persian weavers to Prague, while Henry III's marriage to Eleanor of Provence in 1236 probably caused the introduction into England of the Mediterranean-style mosaic art of paving with inlaid tiles. The nobles, and by the fourteenth and fifteenth centuries the rising class of rich burghers, were also patrons. They hung their houses with tapestries, drank out of silver cups and washed their hands in enamelled dishes. From the fourteenth century onwards the demand for secular plate and jewellery art increased enormously and even commoners' wives had large collections. For example, the last will of the sister-in-law of a Glaziers' guild master shows she owned a golden brooch representing the four points of the compass, a pair of amber rosaries, a silk girdle with roses of silver and a silver cup made in Paris. During the Middle Ages nearly all craftsmen, from bakers to silversmiths were gradually becoming organized into professional bodies called guilds or companies. By the middle of the fourteenth century these were mostly well established institutions combining charitable and social activities with their role as professional control bodies. The guilds laid down how the craftsmen should be trained. The Long Masons' Company, for example, stated in 1360 that an apprentice should be trained for a period of seven years. Besides the practical training, masters were expected to teach reading and writing and were fined if they failed to do so. On the continent particularly, the apprentice would have to end his tuition by executing a masterpiece. In most German goldsmiths' guilds, he was required to produce a cup, a seal and a ring. If he passed this test, he would be able to take the freedom of the company and become a master himself. Towards the end of the Middle Ages, this system began to break down and in order to restrict the number of masters, the apprentice often had to pay a considerable fee before he was admitted. Guilds also concerned themselves with craftsmens' working conditions and dealt with the maintenance of professional standards. We read that in 1374 a certain Catherine Duchemin has been making a cloth 'after the manner of Arras', but with linen thread instead of wool. So the warden of the tapestry weavers' guild petitions the court of London aldermen for permission to burn the offending article. Although the guilds fixed the wages that masters should pay their apprentices and journeymen, the pay the masters themselves received was usually individually negotiated with the employer, the patron. Patronage was all important to the medieval craftsman. In contrast to the present day, the role of the middleman with a stock of artifacts to be sold retail - such as a modern jeweller's shop - was very limited. Without middlemen, very little medieval artworks were produced in quantity, but there were notable exceptions. Large numbers of cheap enamelled copper crosses, reliquaries, basins and so on were produced in the Limoges region of France during the thirteenth century. Many hundreds of alabaster statuettes and altarpieces, sometimes very coarsely carved, were exported from Nottingham, Lincoln and York to other areas of England and the continent in the late fourteenth and fifteenth centuries. The other great difference between the medieval craftsman and the modern artist is that the craftsman did not regard his own personality as an important part of his work. The artist hardly ever left a signature and was rarely mentioned in the records of the time - a baker, after all, would not dream of signing his loaves. There are isolated and tantalising insights into this almost total anonymity, as when Mathew Paris, himself a painter, took an interest in the decorating of his monastery, and provided a list of some of the painters involved. Generally speaking though, it was thought that there was nothing magical about being a sculptor or a silversmith. There are many recorded instances, for example, of Church authorities issuing a written contract for (say) a painted altarpiece, which specifies: (1) the exact Biblical scene or theme to be portrayed; (2) which Saints and members of the Holy Family should be included, along with their relative sizes; (3) the type of colour pigments to be used; and so on. The most prestigious of all the crafts was that of goldsmithing and enamelling. He was frequently a very rich man, in a position to make loans to kings and nobles which gave him considerable status. To some extent he also shared the aura of sanctity and prestige which surrounded the sacred vessels and reliquaries he made. Goldsmiths also made and designed coinage, cut seals and were even sometimes involved in bronze sculpture. Outstanding goldsmiths and enamellers like Godefroid de Claire (c.1100-73) (one of the creators of the Stavelot Triptych - a famous repository for two fragments of the True Cross owned by the Stavelot monastery), and Nicholas of Verdun (c.11561232) (creator of the Shrine of the Three Kings now in Cologne Cathedral) - both of the Mosan school - were in demand all over Europe. Their work, like that of many gold and silversmiths, is highly sculptural, illustrating the close connection between their art and the plastic art of the stone mason. There is some doubt as to how some work was divided between the different trades. Clearly some of the stone sculpture was done by masons who were often called 'imagers'. Whether this means that the same man who carved decorations on pillars would carve the statues on the cathedral facade is not certain. Choir-stalls seem to have been designed by the mason in charge of the building program, but executed by carpenters. Some craftsmen, towards the end of the Middle Ages, seem to have worked in both wood and stone, but specialized 'kervers' also emerged who concentrated on wooden sculpture. It is not clear how many carpenters had permanent workshops and how many simply travelled around carrying their tools with them. Rather more is known about the glaziers. They generally had workshops in the larger towns. Their work was transported by water or overland to the church which had commissioned it. In England the great centres of production were London, York, Norwich, Bristol and Oxford. See: Stained Glass: Materials, Methods of Glassmaking (from 1100). Stained glass is in fact coloured glass, held together by lead. The only actual stain used was the brownish-black enamel which was used for the finer details. In the fourteenth century 'silver stain' was also introduced which gave a golden colour. Only plain glass was made in England until the fifteenth century so coloured glass was imported. Glaziers were by no means above using a design more than once. The Parker window at York, for instance has a picture of St. William which is from the same 'cartoon' as St. Nicholas in the Wolveden window. This repetition does not detract from the windows because their effectiveness depends more on the inter-relationship of the various shapes and colours than upon any single detail. Tapestry art was the one craft which was not closely tied to the Church. The growing wealth of the laity throughout the fourteenth-century produced a desire for comfort, and these woollen wall-hangings became the most important part of a room's furnishings. Tapestries were sold in what was called a 'chamber' which comprised a canopy, a headboard, a coverlet, and six curtains or wall tapestries. The craft was established in England by Henry III's reign (1216-72), but most tapestries seem to have been imported from Flanders. This was such a great weaving centre that Arras, the name of the main town, became another word for tapestry. The local duke, Philip the Bold, owned so many hangings that he had to have a special stone building put up in Arras to house them all. See also: Bayeux Tapestry (1075). Because the hangings were often for palaces and castles, their subject matter was frequently not religious. They showed episodes from the great tales of the time like the Roman de la Rose. By the fourteenth century there were numerous tapestry workers in England, many attracted from Flanders by the Statute of York - a law intended to stimulate the craft. In 1331, the tapestry weavers of London received their statute from the King, but the craft never really took root in England as it did in Flanders. For later works, please see: Gobelins Tapestry (1601-present). 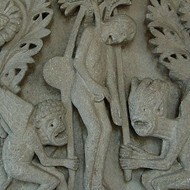 For more about arts and crafts during the Middle Ages, see the following articles. Masterpiece of Hiberno-Saxon Insular Art. Exemplifies the precious metalworking of Hiberno-Saxon Insular Art. Celtic influence on early medieval art in Ireland. Featuring treasures like The Golden Madonna of Essen and the Mathilda Cross. Covering Icon Paintings, Early Russian Icons like the Holy Virgin of Vladimir. Featuring architecture, sculpture, murals, illuminations, glass, carved ivories. Featuring Pskov and Tver sschools, Nereditsa murals, Mizhorski Monastery frescoes. Influenced by the decorative beauty of Byzantine art. Painting, sculpture and architectural designs.  For more about artists and craftsmen in the Middle Ages, see: Homepage.